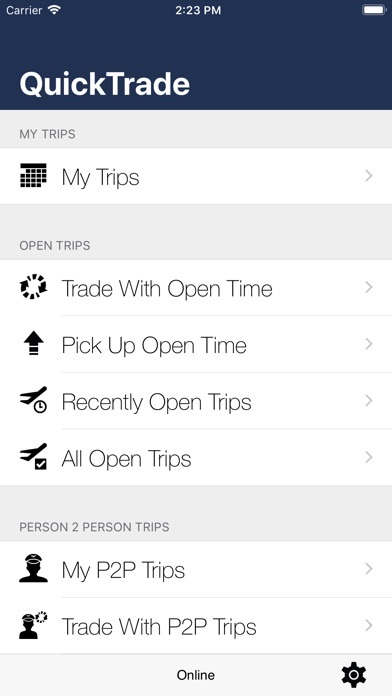 ----------------------------------------- Trade your trips with ease! 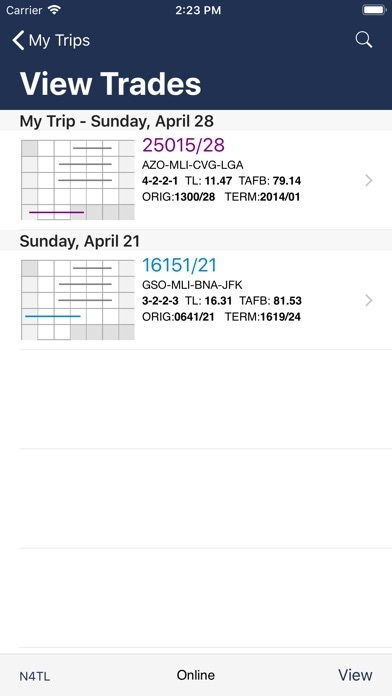 ----------------------------------------- QuickTrade makes it easy for you to see which trips are available at a glance. Compare them to your current trip and decide if you want to make the switch. Press a button and let the app take care of all the necessary computer entries. It's all done for you! ----------------------------------------- Trade with other crew members ----------------------------------------- QuickTrade opens up new possibilities for trading! You're not just limited to trading with Open Time. 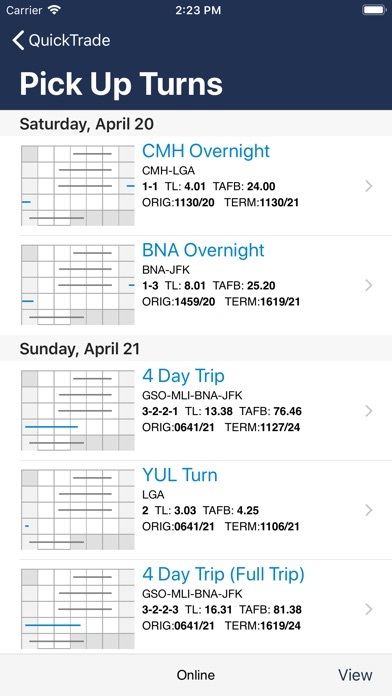 See other QuickTrade users' trips, choose the one you want, and ask them to trade. The app will handle contacting the other crew member, getting permission, and executing the trade. Now everyone can get the trips they want! ----------------------------------------- Pick up open time ----------------------------------------- No longer do you have to search through all the open trips hoping to find something you can pick up. QuickTrade will calculate available turns for you based off the open time in its database. Just select the extra time you'd like to pick up and QuickTrade will handle the rest. 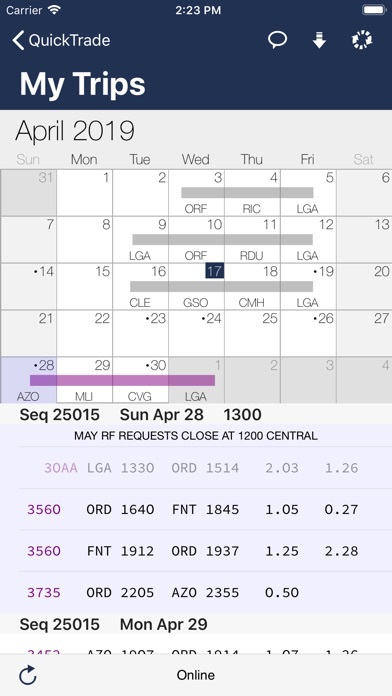 Pilots don't have to calculate 30 hour windows anymore, and the request is emailed. Envoy crewmembers don't have to wonder if an RF entry went through, or if a printer error has destroyed it. ----------------------------------------- Know when trips open up ----------------------------------------- Don't spend your free time checking the Open Time list over and over when QuickTrade will alert you to new open time. You can take a look at the trip, decide if you want it, and get back to whatever you were doing. There is no denying that life without this app over the past week has been a struggle. Life has felt... different, a constant struggle, to understand a software program once marveled in the 1980’s, alive today wreaking havoc on all aircrew that seek to process the simplest of trade requests, only to be met with difficulty. This app has changed my life, given me and my family hope. Thank you Gods of the app they call, “QuickTrade”. I shall name my newborn child after you... Please bring this app back online ASAP. Our careers and lives depend on it!!! We all want to spend less time searching for trips or different trades. I do agree with the developer that every time things hit a snag, and sometimes issues do arise. With the current outage, going back to "old school" searching and trading has been harder. I can only hope the issues between apple and the app are resolved. I have faith that once back online again, will be a great addition. Personally, it has helped me greatly and I am sure it has helped many! Here is to hopes coming back online soon! Thanks Mike! Need to switch your schedule? No problem. Need to pick up hours? No problem. Need to proffer quicker? No problem. ...... this app is a must as a crew member! 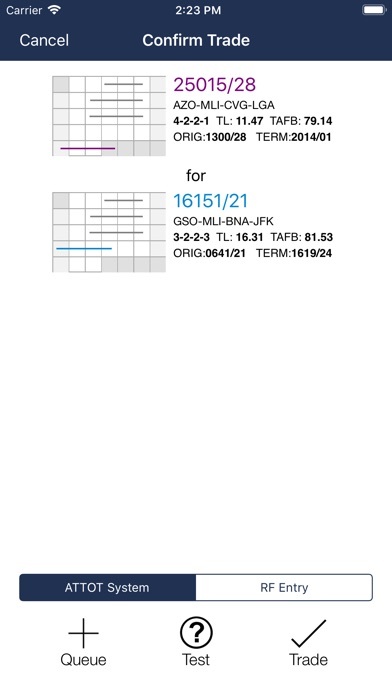 To be honest, this is the best app a Crew member can rely on. Easy OT trips pick up, easy trip trade. Whether you are a line holder or reserve, life is easier. Thanks to the creator of this app! I want answers on why we think this is causing problems with AA’s CCI!! It never caused problems with the old CCI so would have no cause for the new CCI. I believe it’s American/Envoy trying to get rid of it all together!!! Literally the only app I pay for! It has changed the whole way I handle my schedule. If you are a line holder, you NEED this app. If you’re on reserve, it’s still bomb for easy hotel requests and reserve listings and OT pick up. Makes picking up OT, proffering, looking at the reserve list and a lot more very easy. Thank you!